alwar was during the reign of Prithviraj, in 1191, that Muhammad of Ghori invaded India. Prithviraj died fighting the sultan's army, and with the establishment of the Sultanate in Delhi, a new era began. 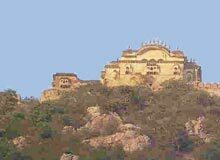 History of alwar, Rajasthan, is an interesting one. It dates back to an ancient era, about 3500 years ago. That was the period when the Pandavas, made famous by the Mahabharata, lived. At that time, alwar was called Matsya Desh or in other words, the 'Land of Fish'! Matsya Desh, in fact, referred to the whole area around the present districts of alwar, Jaipur and Bharatpur, along with Viratnagar which was its capital. During the turbulent medieval times, the city of alwar developed into a place of great importance. Being an area of strategic importance, alwar was coveted by many. This counts the Mughals, the Jats of adjacent Bharatpur, Jaipur’s Kachhawaha Rajputs, the Nikumbha Rajputs, the Marathas as well as the British. All these people had their rule in alwar at different points of time. According to alwar History, the Nikumbhas were, in all likelihood, the first to rule this region. Origin of alwar tells that it was an important base for the Mughals. It was from this place that they started their attacks on Ranthambhore Fort. alwar was also a halt station for the Mughal emperors who used to stop here for a while during their travel between Ajmer and Agra. After the Mughals, History of alwar points towards the Jats who ruled over alwar, albeit for a short period.